Community Flower Project Growing Strong! A local resident was so impressed with the 8th grade project that he called school and requested a flower for his yard. "My wife designed and I constructed the two new additions . 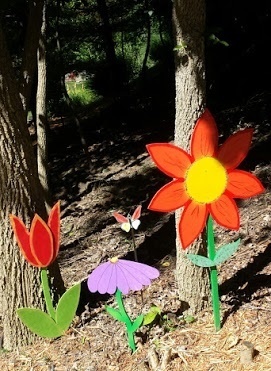 The butterfly and bumble bee are stained glass pieces that I made to make the three wooden flowers even more whimsical. Kudos to everyone at Grant Middle School who were involved in conceiving and implementing this 8th grade school project that has added pizzazz to the Fairview Heights community landscape!"